The strain that your legs feel from challenging mountainous landscapes is a good kind of strain – one that comes from good old manual hard work that isn’t as easy to find anymore these days. However, does this mean that you have to be stuck wearing your heavy hiking boots? Don’t you want to wear something more comfortable while hiking? If so, you might want to look into getting the best hiking sandals. Besides being lightweight, hiking sandals are structurally designed to be completely different to the sandals that you would wear down to the beach. The contoured footbeds make your foot stick into the shoe, without slipping around. Also, most hiking sandals feature soles that are both thick and sturdy—usually made of tough rubber. This gives your feet an added level of security. But how do you know which sandals will protect your feet and which will leave your poor feet defenseless against the elements? That’s where we come in. We are going to explain how to tell the difference between reliable hiking sandals and undesirable ones in great depth. After you’ve gained an understanding regarding what kind of hiking sandals you want to purchase, we will move on to the recommendations. In hiking boots, it is easy to feel your feet getting warm and wet as your body starts to heat up more, resulting in friction between your feet and your boots. This is usually caused by trapped moisture, and it can result in painful blisters. This is why you should pick hiking sandals that are made from breathable materials. Your hiking sandals have to be well ventilated simply so that your feet don’t start to overheat. This is especially common if you’re hiking in a hot climate, with dry or humid conditions. So how do you know which hiking sandals are breathable? For starters, they should be lined with mesh – and make sure that the mesh is hydrophobic so your sandals wouldn’t get water-logged at the slightest contact with water. Hiking sandals also have to be very versatile. No one wants to go out and buy a pair of hiking sandals that are only suitable for a hike that doesn’t involve any rocks, for example. It would be a waste of money. 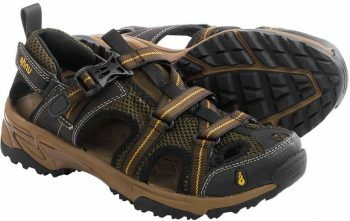 So, instead, you should go for hiking sandals are specifically designed with numerous technical features. These features mean that they’re suitable for the vast majority of hikes, and they can make hikes trouble free. The only hikes they shouldn’t be worn on are extreme mountain hikes, where the terrain can be tough on your ankles and ankle support may be necessary. When you wear hiking sandals, your ankle isn’t protected. You shouldn’t wear sandals if you’re going on a giant mountain trek, but they are perfectly suitable for almost any other type of hike. Having very light hiking sandals is something that will benefit any hiker, and it proves to be the ideal option for most. We’ve all hit the point before where we are out of energy, and our hiking boots start to feel like rocks that we’ve strapped to our feet. By wearing lightweight products оn your feet you can save yourself from that pain, and while it won’t save you from the weight of your pack (a high energy bar might), it will help your legs to feel like they haven’t been attached to anchors. As for what constitutes as light, anywhere between two to four pounds is good enough. Hiking sandals are usually made out of either synthetics or leather, and both are good options for different reasons. Leather sandals are best suited for hot, dry weather, while synthetic sandals are best suited for mixed or slightly wetter weather. Synthetic sandals can dry out a lot quicker than leather sandals do, and you will find that due to this the majority of hiking sandals are lined with a synthetic material. This helps to wick away any excess moisture that your feet might be carrying, helping to stop friction between your foot and the sandal—the best blister defense. To determine the reliability of hiking sandals, we need to take a look at their individual parts. Let’s start with the sole. When you look at the vast majority of normal sandals, they usually have soles that are incredibly thin and made of a flexible material. What would happen if you stood on a sharp rock while wearing those? It would hurt. The soles of hiking sandals are different, as they have been designed to work with a variety of terrains. Good hiking soles need to have a perfect balance. It needs to be lightweight, but it also needs to protect your feet from the terrain underneath you. You need it to be rigid enough that you don’t feel the impact of sharp rocks or uneven pieces of trail. Usually, soles are made of a tough, but lightweight rubber. Next, let’s take a look at the footbed construction. In most shoes, you can wiggle your feet around just a little bit, and that’s exactly what hiking sandals aim to avoid. The best way to keep your feet safe is to keep them sturdy and secure. To make sure that this is the case, almost all of the footbeds found on the sandals that you will be looking at are contoured – shaping the sandal around your foot so that your foot can’t move around. The ideal footbed will also be either padded or cushioned; this helps to keep your foot protected from impacts or shocks that you may feel while you’re out hiking. Last but not least, don’t forget to take the straps into account. On hiking sandals, the straps and closures can vary dramatically. Just like with the footbed, the aim is to keep your feet as secure as they possibly can be. Most hiking sandals that you find will feature a padded heel strap—this is to offer extra protection to the back of your foot. It also helps to stop your foot from rubbing against the heel strap. You will also find that the straps on hiking sandals feature more closures than other sandals you can purchase on the market for the same reason. You can ensure that your foot fits snugly in the sandal without issue. We understand that it can be almost impossible to spot a good pair of hiking sandals if you aren’t entirely sure what it is that you are looking for. 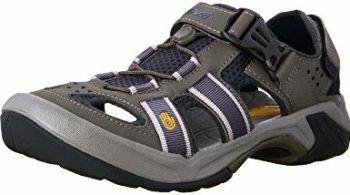 So that you don’t have to worry, we have gathered a list of eight different types of hiking sandal for you, all of which are perfect for the vast majority of hikers. 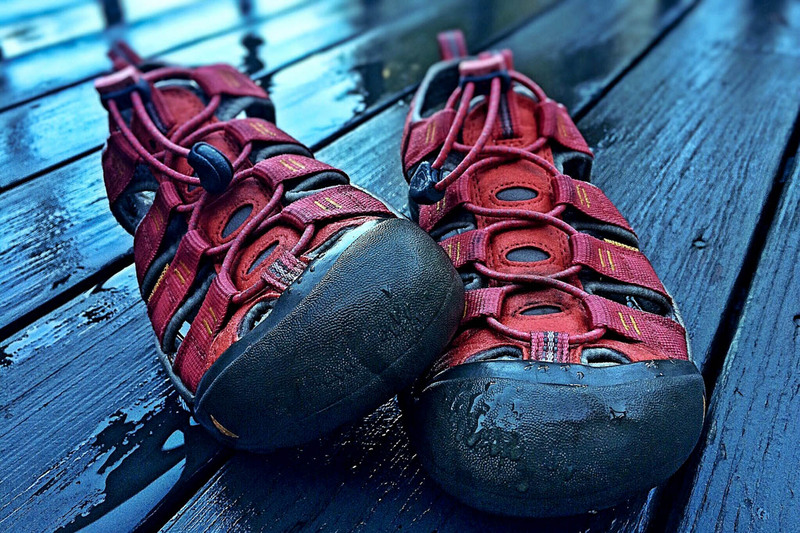 KEEN is one of the leading manufacturers of hiking sandals on the market today, and this is a fantastic example of one of their great all-rounders. Whether you’re looking for a pair of sandals that you can hike up a mountain in, or a pair that you can run across a meadow in, these are perfect for you. A lot of people who already own KEEN Arroyo II Sandal have put them to the test in numerous different ways. But, be aware, they are water-resistant, not water-proof. You don’t want to attempt to go swimming in them just yet! The hydrophobic mesh lining means that they are good for simple water sports, such as kayaking or canoeing, but getting them too wet would simply mean wet feet. They have also been designed with safety in mind. They feature a metatomical dual-density footbed that will keep your foot stable and secure. While also offering you a good level of both arch and heel support. KEEN is proud to present a one-of-a-kind patented rubber toe cap with this one. This cap effectively keeps your toe from rubbing against the rough fabric; it also offers a higher level of flexibility. Although this is not a specialized climbing sandal, the durable and comfortable rubber toe cap makes it a feasible choice for some mild climbing. Related: Although the Arroyo II Sandal is quite tough and should be able to endure more than a few rough hiking trips if your insoles have started to wear off, don’t wait before replacing them with this Keen Utility K-10 Replacement Insole. Teva is another brand that currently stands out on the market, mostly for their excellent customer service and their trustworthy product designs. 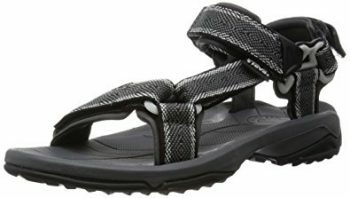 Most of the customers who have bought the Teva Omnium Closed-Toe Sandal use it for either hiking, biking, or a variety of water sports (swimming not being one of them). You can hike for hours in this sandal, as they’ve been designed with a special encapsulated shock-absorbing heel pad, as well as having a great arch support system. A few customers have found that the soles of these sandals do wear away over time, but Teva will replace the sandals of any customers who experience this. One downside we think deserves to be mentioned is that these sandals take some time to break in. The material is a bit stiff, but once you’ve got it to mold to the shape of your feet, you’ll be hard-pressed to find a more comfortable pair of hiking sandals. Related: Now that the bottom of your feet are as comfortable as they can be, don’t forget to protect the top of your head too. This Hippih Bucket Boonie Hat offers a UPF 50+ sun protection, so even if you were to go hiking at the height of summer, you wouldn’t be at risk of overheating. The KEEN Newport H2 Sandal is another fine example of the ingenuity that this established outdoors gear company has to offer to the market. 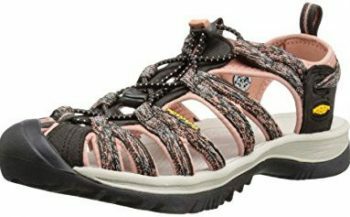 They are experts at designing sandals that can be used in a variety of different situations, but these shine as being perfect for hikes that involve water crossings. This is partly because of their synthetic makeup, the synthetic material that the sandal is made of will dry quickly. Be aware that they do also come in a leather version, which is good for dry hikes, but they would take forever to dry on a hike that involves water crossings. The sole itself has also been designed with a water crossing thought in mind. The multi-directional lug pattern on the sole offers extra levels of grip. This will help to stop you slipping on any stray rocks that may be hidden under the water. Unfortunately, the adage that good things never last applies truly here. This isn’t the most durable pair of hiking sandals, and you shouldn’t expect it to be able to last for years. Related: If you plan to challenge water-related activities, you should wear shorter pants like these Columbia Men’s Silver Ridge Cargo Shorts to keep them from getting wet. Although, even if these pants do get wet, it won’t be much of a problem because they are made of quick-drying materials. 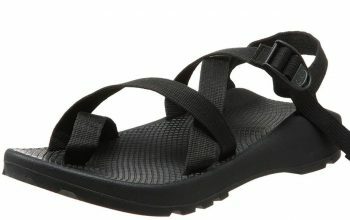 At first glance, Chaco Z/2 Unaweep Sandals look simple, yet they feature one of the best things a hiker could require. They have a BioCentric footbed that has been approved by the American Podiatric Medical Association. You have the medical reassurance that your feet will be comfortable in these sandals, as they offer excellent support for every area of the foot. They also feature Vibram soles, some of the toughest soles that you can get. Gone are the days of sharp rocks stabbing you through the soles of your sandals. These are also simple to put on, with straps that are both quick and easy to fit. As well as an added layer of security offered by a simple, small toe strap. This helps to stop your feet from moving around while they’re nestled in the bed of the sandal. One thing you’ll want to take into consideration if you’re thinking about purchasing this pair of sandals is that they run rather narrow, so you might want to go a size up to avoid blisters. Related: No matter what kind of hiking adventure you plan to wear these sandals too, you can easily match them with these Columbia Backcast III Shorts. They are brightly-colored and durable. They also offer UPF 50 sun protection and are quick-drying. One thing that makes Teva Terra Fi Lite Sandal stand out is the padding system. There isn’t an area of this sandal that rests against your foot that isn’t padded. This means that you can hike in them for hours without the uncomfortable rubbing that you can experience in poorly padded sandals. The sole is flexible, making these easier for walking in. But, it also means that the sole can break down over time, and Teva will replace these sandals on a case-by-case basis. For long-distance, all-terrain hiking you also need a comfortable heel that is capable of absorbing shocks that would otherwise be absorbed by you, and this sandal offers just that. It features a soft Shoc Pad comfort heel, perfect for keeping your feet safe so that you can hike for longer without any pain. The heel is also quite thick, so you’ll be well protected from that uncomfortable stabbing feeling that walking on sharp rocks can sometimes cause you. Related: You need to eat good food to keep you going while on one of your outdoor adventures. This Backpacker’s Pantry Lasagna is exactly what you need—delicious, easy to store and prepare, and very filling. If you’re looking to go hiking when it could rain, sandals might not look like the best of options. 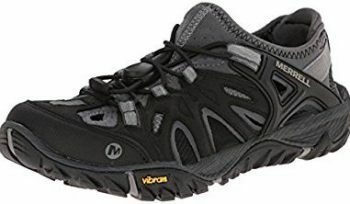 However the Merrell All Out Blaze Sieve Water Shoes are perfect for all weather hiking, as the synthetic material that they are made out of dries out quickly. The Vibram sole that it features also has a good tread, meaning that you’re less likely to slip if the weather does suddenly turn on you (don’t forget your waterproofs, your feet might dry quickly in these sandals but the rest of you won’t). Some customers have found that these shoes run narrow, so in some cases, it might be advisable to size up, especially if you have wider feet. But, they are extremely comfortable, with added neoprene pockets that stop your feet from rubbing against the sandal. The Omni-fit lacing system is easy to handle. You wouldn’t need to worry about your feet slipping out of these shoes because this lacing system will keep your feet securely inside. Related: You should never forget to bring a hat with you when heading out for an outdoor adventure. This Wallaroo Scrunchie Sun Hat is a great choice not only because it can be crushed with other things inside your backpack then bounce back as if nothing had happened, but also because it offers a UPF 50+ sun protection. When it comes to buying new hiking sandals, we all usually dread that period of ‘breaking-in’ the shoe. You know what it’s like—the shoe rubs, you end up with blisters. It’s not fun for anybody. 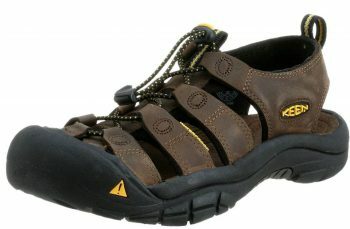 If you are looking to avoid that ‘break-in’ period, then KEEN Whisper Sandal might just be the right sandal for you. Its additional neoprene pockets extend right around your ankle, where sandals would normally rub initially. This results in a blister-free experience. Even people with arthritis have found that these sandals offer them all of the support and comfort that they require, with a metatomical footbed design that offers a mixture of both security and comfort. While the hydrophobic mesh lining means that they are also suitable for water crossings while hiking. One factor that makes this sandal stand out from the crowd is the color options that it is available in, with 33 different choices available. Unfortunately, these sandals are not for casual wear around urban areas—especially indoors as they have quite a bad grip on smooth flooring. They can grip onto wet rocks and ground easily, but for some reason, the same cannot be said for marble flooring especially. Related: As long as it’s not urban use, these sandals can handle pretty much anything. If your trek involves water crossing, don’t forget to protect your phone with this JOTO Universal Waterproof Case. This is the go-to waterproof case for pretty much any smartphone as long as it doesn’t exceed six inches in diagonal size. The Ahnu Kovar Sports Sandals feature an EVA foam midsole. This midsole is a great example of the technicalities that go into designing sandals for hiking, as it consists of semi-rigid composite elements that absorb shock that would otherwise be absorbed through your feet. While doing this they also add an additional layer of support to the heel of your foot, allowing you to hike for longer periods of time. They are known for being incredibly comfortable, and yet rigid enough to be suitable for uneven and rugged terrains. 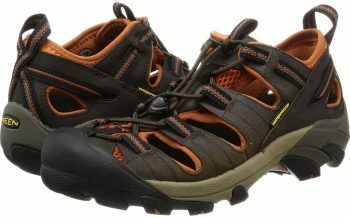 They are a favorite for thru-hikers, due to their durability, and their grip through the elements. These sandals come with straps that can be easily adjusted, but they also come with clips that cannot be adjusted. Some might consider this quite a big flaw as the clips clamp on rather tightly and may cause the skin around your feet to blister if rubbed against them too often. Related: Keep your sandals from smelling bad with this Nature’s Way Activated Charcoal. The activated charcoal works actively to bind bad smells, so after you’ve left them inside for a specific amount of time, simply throw them out. They are environmentally friendly, so you wouldn’t even need to worry about how to dispose of them. This is where our review ends. As hikers, at some point or another, we all experience painful feet. It can be crippling. Going out in just a normal pair of sandals will undoubtedly end with sore feet and a grumpy hike. But you don’t have to worry if you’ve got a good pair of hiking sandals protecting your feet. Gone are the days of the heavy walking boot, and here are the days of the lightweight, shock-absorbing sandals. Whether you’re looking for the ultimate sandal to hike in or something to go kayaking in, there is a sandal on the market that is perfect for you. Always look for that contoured footbed, and make sure that if you are doing water sports, the sandal has some hydrophobic lining. So, do you think you will be able to leave the walking boots in the cupboard for your own pair of hiking sandals? If you can, you might be pleasantly surprised by the results. Or, have you already purchased your own hiking sandals? If you have, then let us know what you think about them in the comments below!